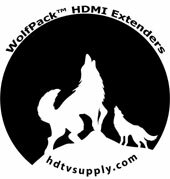 Part of HDTV Supply popular WolfPack family of products the WolfPack HDMI over CAT5e Extender allows up to 1080p HDMI video & audio to be wired up to ~700 feet using only one low cost CAT6 cable or ~500 feet using only one CAT5e cable. It comes with both a transmitter and a receiver, 1-AC adapter (as it has POE) and has 38-KHz bidirectional IR to control a source device as well as the TV. It also supports Point-to-Point and Point-to-Many. (See below for distances with different types of cables). 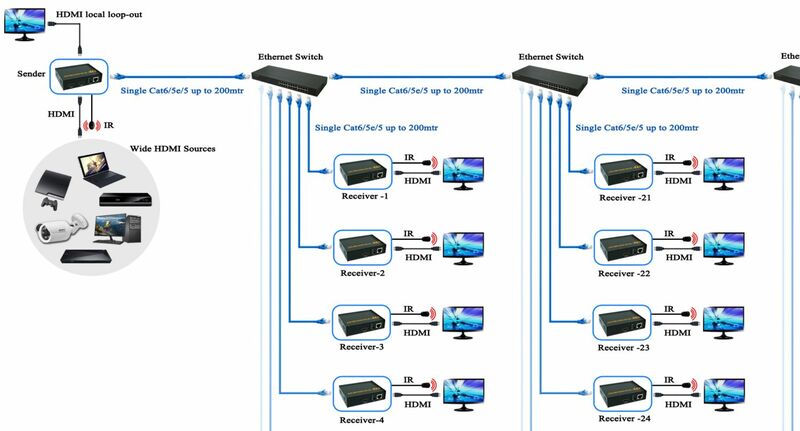 The HDMI over CAT5e Extender includes two boxes - one HDMI transmitter (TX) & one HDMI receiver (RX). The transmitter connects to a HDMI source with an HDMI cable. The HDMI receiver connects to a display in the same way. Between the two modules, one low cost CAT5e or 6 cable is used to send the HDMI video & audio signal as well as the IR signal. The HDMI Loopout sends the HDMI signal from the TX to local TV. Features 38-Khz Bi-Directional IR: Over the same CAT5e/6/7 cable you can send commands from a control system to the TV as well as simultaneously control DVD players, cable boxes and other source equipment from the TV location. The IR works in only stand alone applications with one source and one TV. The supplied AC adapter may need to be put on the Receiver, not the Transmitter, if you are using the IR function and some remote controls. NOTE: We recommend strongly that you use good CAT5 / 6 cables with any CAT5 / 6 converting products like this one. Most of our "no picture" support calls are due to poor quality and cheap or poorly made cables. Since it is high definition video we only recommend CAT5/6 cables with specs like our CAT-5 /6 cables either bought from us or another high quality supplier. We also recommend, if possible, pre-made cables that are factory tested vs. field made cables due to the advanced testing methods used. 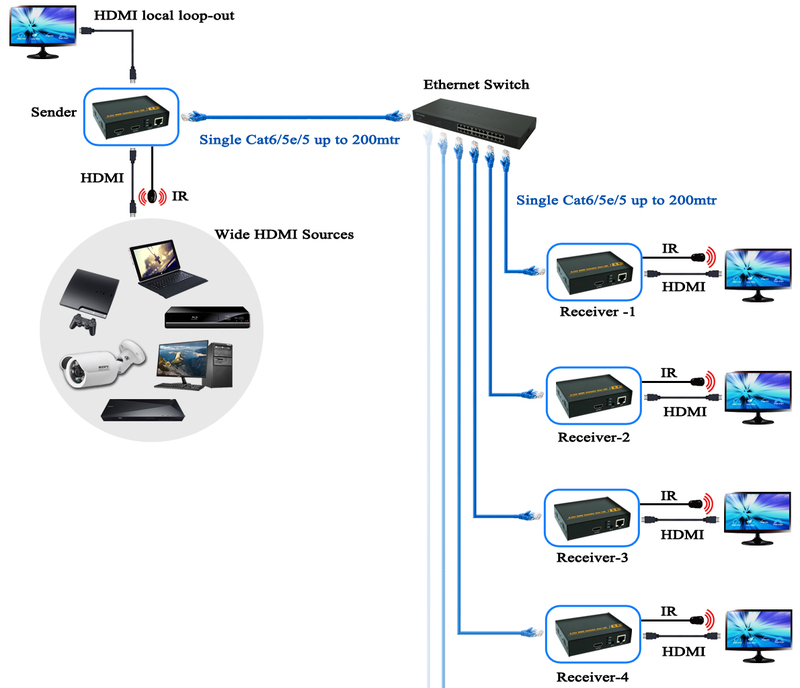 Why not this WolfPack HDMI over CAT5e Extender set today? Any 2D or 3D HDCP compliant HDTV, monitor and projector. If the source is HDCP compliant and your TV is not, you will not get a picture. Please check your TV manual or the manufacturers web site. HDTV Supply includes a 1 Year Limited U.S. Warranty on this HDMI over CAT5e Extender. The U.S. warranty states that (a) its products will perform substantially in accordance with the accompanying written materials for a period of 1 year from the date of receipt and (b) that the HDMI over CAT5e Extender will be free from defects in materials & workmanship under normal use & service for a period of 1 year. In order to get a warranty replacement for a defective item, HDTV Supplys Support Team will verify the product is eligible for warranty. An RMA number will then be issued. Shipped replacements will be in like new conditions, tested and all components included. A 30-day RETURN also comes with this warranty as well as Free Lifetime Tech Support. HDTV Supply also sells a 3 and 5 Year Extended U.S. Warranty for this HDMI over CAT5e Extender. Please go to Extended Warranties or see the above Options to purchase it.